Freddie Colloca's Mission statement: "I want to bring audiences to their feet in celebration, and to their knees in worship. I'm flattered by comparisons to so many great artists, but truthfully I'd hope one day I could be compared to David, or one of the great men of the Bible who lived his life for God, and encouraged others to do the same." Freddie Colloca is the new voice of Christian Latin pop music, who of as the week of July 15th, has made it onto the top ten seller's List of Christian Artists, moving up to number three. Freddie Colloca is 27 years old, single and has no kids, but has a powerful music ministry that started in the Spanish speaking community of Miami, and has since easily bridged into the mainstream of the Christian music market. Freddie has the distinction of being one of the few Latin Christian music artists that can more than hold his own in mainstream Christian music market and exceeds in areas of singing / performing / recording with a huge amount of energy, enthusiasm, and passion these new and unique songs that he wrote in English with several other people, to produce his first English album, UNCONDITIONAL. 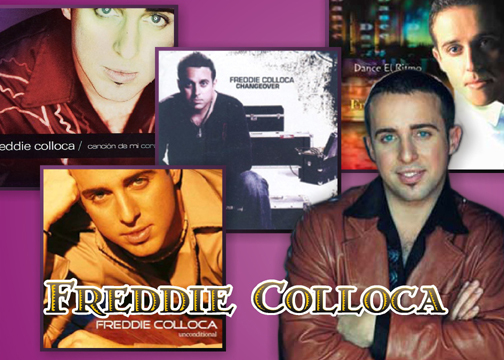 Freddie Colloca has been compared to Ricky Martin, Enrique Iglesias, Marc Antony, and Luis Miguel, in that his music exemplifies the best of the Latin music movement, whether it is Latin rhythm dance music, smooth Latin pop or beautiful ballads. The important difference is in that he is putting his all into bringing glory and praise to the Lord, showing his passion for the Christian Gospel, bringing Jesus to his audience, introducing Him as our Savior, who has taken away our guilt and sin, explaining his sacrifice in our place on the cross and saving grace of Christ, that is a free gift to all who believe. Jesus loves us unconditionally, testifying to His comforting presence, and the profound freedom that comes from knowing him. Freddie is not new to Christian music. Freddie was immersed in it from an early age, as his pastor father had a Spanish Christian folk group, while also being a pastor of a Christian church in Argentina. Interestingly, in an interview with ChristianMusic.com, Freddie said that the five other members of his band are also children of Christian pastors, who had ministries in Venezuela (his percussionist), Puerto Rico (his keyboard man), Argentina (his guitarist, and his base guitarist) and Niagara (His drummer). While still a little boy, the Colloca family immigrated to America, when his father was assigned to a church in New York. The Colloca family wound up moving to Miami, where Freddie spent most of his childhood and youth. Young Freddie discovered his own gifts for praising God and developed his skills while singing / playing in the services at his father's church. Musically, he taught himself, learned piano from his father, experienced music in school and took voice lessons. He also got first hand experience leading praise and worship singing in his father's church, as a teenager. In an interview with ChristianMusic.com, Freddie said that as a little kid, he was inspired and influenced by Christian artists Michael W. Smith and Amy Grant, two people who were performing at young Freddie's first Christian concert that he attended. Hearing the call to enter Christian ministry, he enrolled in Bible College studies at the Miami branch of Charity International University, to get a rock solid knowledge of the scriptures, and to be trained to be a Christian leader. After two years of study, he was invited by the renowned Hispanic praise & worship leader Marcos Witt to study for a year at Witt's music school, called The Center of Musical Dynamics, which is located in Mexico City. His music was further enriched by such a great opportunity. While finishing his last two years back at Charity International University, he was also busy recording two Spanish albums of his songs, coming from his passion and dedication for the Gospel of Jesus Christ. After earning his degree, Freddie was fully prepared to start his Christian calling through a music ministry as a worship leader, performer and recording artist. He started his effective Christian music ministry in Florida, among the Latin communities, with his songs written in Spanish. He developed quite a following and one can see why. Colloca was recently named one of the Top 10 Breakthrough Christian Artists for 2002 by Radio & Records Magazine, adding to his being a three-time Dove Award nominee and three-time Viva Award nominee. In 2001, he received a nomination for his Spanish album at the DOVE awards. In 2002, he translated into English, one of his Spanish albums, DANCE EL RITMO, and received another nomination at the 2002 Dove Awards for the title song, "Dance el Ritmo". However, in an interview with ChristianMusic.com, Freddie Colloca said that he didn't think that translating Spanish into English worked too well, and was inspired to write songs with several other people for his first English album, UNCONDITIONAL for the mainstream Christian community. He is currently busy translating this English album into Spanish, which is easily done, unlike trying to translate Spanish into English. This Spanish-language version of UNCONDITIONAL, Canción de mi Corazón will be shipping to CBA stores in March 2003. He is also now working on writing songs for a live worship album, which he hopes to record early next year. While not creating new songs, Colloca will be doing a lot of touring around the United States, giving concerts this year. His most memorable concerts were the very first ones that he did in English, in Sarasota, Florida because of the ministry, and touched lives that resulted. "I want to bring audiences to their feet in celebration, and to their knees in worship." - Freddie Colloca. The Music of UNCONDITIONAL - testifies to God's comforting presence, his unconditional and the profound freedom that comes from knowing Him. Some songs are high energy Latin dance music that is infectious with praise and the love for Jesus / God. Others are beautiful ballads, expressing heartfelt truths about the Christian Gospel, expressing what it is like to be in fellowship with Jesus, the importance of turning to Him. The Latin style musical compositions of these songs are stunning as well, using a variety of dynamics, instruments, percussion, each uniquely different, complimenting his lyrics, not overpowering their important message of the Good News. Proclaiming the Christian Gospel is the main goal of Freddie Colloca's music ministry, destined to transcend his Spanish audience to people of all backgrounds. 1) Title song: "Unconditional": (Heavy Latin drums, plus synthesized instrumentation, soft organ chords, light Latin percussion - until chorus horns join in swelling the background track). Lyrical Sample: Father, Father, I'm on my knees, how can I thank you for all that you have given me? Father, Father, King of Kings, You're the Reason, for everything. Nothing I could say to you, would ever be enough., My life will be a testament, to the glory of your love. Chorus: (Inspirational, unmistakable, irresistible,unerasable, undeniable supernatural, indefinable, unconditional). 2) "Savior, My Savior" (Synthesized keyboard work, Latin drum beat, full horns / strings. Quiets down to piano, light drums). Freddie Colloca told ChristianMusic.com that this song is the most popular among the public, and has been released as a single. He describes it as a bold and aggressive song that says what Christians believe. This song became a Top 5 A/C radio hit. Lyrical Sample: -When there's no peace, I turn to you, You are my reason to hope, When there is no way out, I run to you, there's no where else I can go, You are the River of life in my heart, I am believing in all that you are. Chorus: You are the River of Life in my heart, I am believing in all that you are. Savior, My Savior, the same hand that is spinning the world, is soothing my soul, Savior, My Savior, I have no reason to fear, you're in control. 3) "You Chose My Heart" (Ballad -Interesting synthesized instrumentation, a variety of sounds, some guitar, percussion). This song is currently Freddie Colloca's favorite, as he relates to the words, and it is his favorite song to perform in front of an audience. Lyrical Sample: I can't believe my heart, would be the place that you'd desire to be, more than any where. Like an Angel in the dark, you find the secret parts, that no one sees. I can feel you there. It's strange to me, that you will love me when you know me like you do, but that's just the way you are. Chorus: In all my dreams, I could never imagine all You have for me, the things I have yet to see. In all my life, I'll never understand just what you saw in me, for I was so unworthy, Yet from the very start, you showed your love, when you chose my heart. 4) "Close" (Starts off with soft piano - synthesized instrumentation, strings, guitar builds into full strings). This song really touched this reviewer, and is truly a beautiful example of a personal prayer set to an inspiring musical backdrop, with effective use of musical dynamics. Lyrical Sample: I come before you God, I toss my flesh aside, so you can use me, I strip my soul down bare, and shout to you this prayer, Please work through me. Chorus: And draw me near, to where you are, lead me Lord, direct my heart, cause I want to be, where you need me most, draw me, bring me, close. 5) "Surrounded" (A Great Dance Praise Song - Synthesized beat and Latin drum rhythm (dance beat), electric and acoustical guitars) - This is a song, describing a personal relationship with Jesus. This is one of this reviewer's favorite praise songs on this CD. Lyrical Sample: I breathe you in, I breathe you out, you're the air that I can't live without, I can't escape, still I'm free, You are everything I feel and see. Chorus: You are over me, under me, I am surrounded, I am surrounded by you. You are holding me, constantly, I am astounded how I am surrounded by you, I am surrounded by you, I hear your voice, I feel its touch, I have never been in need this much, You're in my blood, you're in my veins, you move in ways that I can't explain. 6) "Song of My Heart" (Peppy Latin Dance/ Praise Song - Synthesized Latin beat, Latin percussion & drums, acoustical guitars - peppered with horns / synthesized instrumentation background in parts). Starts off with a drum / percussion solo, done Latin style, that may get you dancing around the room, while singing along! This song used to be Freddie Colloca's favorite on this album. It was written in a little room in Nashville, where it was extremely hot outside. They were inspired and touched by God when they wrote it. Lyrical Sample: I hear the music in my mind, I begin to sing the tune, spinning lyrics from my heart. I write this melody for you, cause every day I need you more, take this heart forever, I'm yours, I'm yours. Chorus: You're the beat that makes me groove, every melody is you, you are the song of my heart, (repeat in Spanish), You are the song, you are the song of my heart. 7) "Your Love, My Heart" (A ballad with an easy Latin beat, percussion, piano, guitars, strings, choral back-up). Lyrical Sample: In my life, a thousand questions, that I want to ask, in your love I find the answers, it's as simple as that, you are there when I am lonely, Your arms reach out to hold me. Chorus: You're love, my heart, were never meant to be apart, My life, your grace, you take me to a higher place, you are are the light, the way for the world, who has loved me right from the start, Lord I can't live without you, your love, my heart. 8) "Instead of Me" - (A beautiful hymn-like ballad, chords from electric guitars, supporting acoustic guitars and piano). This song makes Jesus's ultimate sacrifice personal to the listener. Lyrical Sample: Where's the answer to this question? What's the meaning of it all? Who is paying for Salvation? When will the hammer fall? As I look into the mirror, all I see is grace, and its hard to believe that love has taken my place. Chorus: Instead of me, there you were, taking the weight of my sin and my shame - Instead of guilt, your mercy there, paying a price that I just couldn't pay, you carried the weight of the cross to Calvary, instead of me. 9) "Me Libero" (I'm Free) - (Hot Latin beat, piano, guitars, drums, intro. Latin beat and chords). - Another energetic praise song for Jesus, and celebrating what he did for us at Calvary. Lyrical Sample: I wasn't made to dwell in the lowlands, chained like a slave to the things of this life, he gave me wings to fly to the mountains, leaving my worries behind. It is there he renews my vision, it is there that I finally understand that there is a place called freedom. There I was enslaved to the memories, trapped in the cell built with years of regret, there was love the cost of Salvation, with his blood, paid my debt. It took love to renew my vision. Took the cross for me to understand, that there is a place called freedom. Chorus: (Me Libero, He liberated me, and now I will sing his praise, Me Libero, He came to set me free, to live in the fullness of grace (Repeated in Spanish). 10) "Just when I needed You Most" (Moving, beautiful ballad - Another favorite song of this reviewer). Features piano, strings, light percussion. Lyrical Sample: I thought I knew, just where this road of life was leading to, alone I stood, nobody could, tell that I was lost, but deep in side, my hurt, my fear, my pain, my pride, led me to my knees, where I broke down and cried. Chorus: You appeared to me, showed me love's eternity, You rescued me, Father, Son, & Holy Ghost, Just when I needed you most. Colloca is currently touring with NewSong, Mark Schultz, Ginny Owens, and Brother's Keeper on the highly successful Christmas Shoes Tour.